Her beauty is divine. His heart yearns for another. Will attempted revenge result in true love? Emily is the last unmarried Sinclair sister. For all her spellbinding beauty, she’s never been able to clear a certain man from her head and her heart. He’s made it clear there’s no hope, and now he’s about to marry her best friend. The Earl of Bracebridge knows how to hold a grudge. The former prizefighter turned disreputable nobleman hoped to marry Emily’s sister until she was forced to wed another. After his hopes for a suitable marriage are dashed once again, he seizes the chance to settle the score with Thomas Sinclair---by eloping with Emily and consigning them both to a union without love. Emily knows Bracebridge loves another, but every time they’re alone, sparks fly. Can the Earl get past his heartbreak to realize the perfect woman didn’t get away -- she’s already his wife? 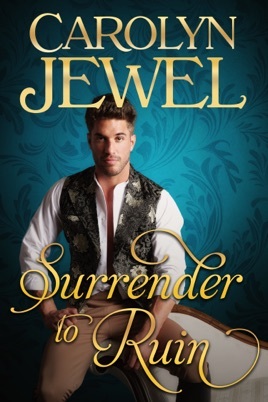 Surrender to Ruin is the long-anticipated third book in the Sinclair Sisters historical romance series. If you like unmistakable chemistry, sizzling romance, and potent regency drama, then you’ll love the next chapter in Carolyn Jewel’s heart-pounding series. Buy Surrender to Ruin to continue the breathtaking trilogy today!